Ricoh had a reputation for producing superb 35mm film compact cameras such as the GR I and GR21 that found favour with enthusiast photographers. However, despite producing high quality images, the company's digital compact cameras such as the Ricoh GR II and Ricoh GR Digital IV haven't really attracted the same attention. 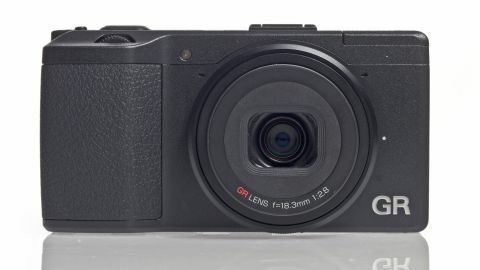 The Ricoh GXR, a compact system camera (CSC) that couples the lens and sensor into a single interchangeable module that slots into the back, which houses the controls and the LCD screen, confused the company's fans and consequently also failed to sell in high numbers. The new Ricoh GR, however, could be about to put the company back on the map for photography enthusiasts because it is a compact camera but its 16.2 million pixel sensor is an APS-C format device rather than a 1/1.7-inch unit as is found in the Ricoh GR IV. It also affords full control over exposure (as well as automatic and semi-automatic control) and images may be saved as raw or JPEG files - or both simultaneously. At around £599/US$796 (approximately AU$882) the Pentax Ricoh GR's price is also much more attractive than that of the Nikon Coolpix A and the overly complicated Ricoh GXR. Furthermore, despite the 9x increase in the size of the sensor, the GR isn't a great deal bigger than the GR IV and it fits neatly into the average coat or jacket pocket. It's a similar size to the Nikon Coolpix A and Sigma DP1, and a little smaller than the Fuji X100S. Like the Nikon Coolpix A, the Ricoh GR's APS-C format 16.2MP CMOS sensor has no anti-aliasing filter, which should enable it to capture sharper details than a comparable sensor with the filter. Omitting the filter brings the risk of moiré patterning in images with fine repeating patterns of detail, but it hasn't been an issue for the Nikon Coolpix A, Nikon D7100 or Nikon D800E. Even if it is a problem, moiré patterning can be dealt with using image editing software, but the Ricoh GR also has in-camera post-capture moiré reduction available. Because it's a compact camera the Ricoh GR has a fixed lens, and, like the optics on the other APS-C format compact cameras, it has a fixed focal length. In this case it's a 18.3mm lens, which is equivalent to around 28mm in 35mm terms. This and its small size makes the GR ideal as a 'walk-around' camera and well suited to shooting street and documentary photographs as well as landscape images when you're out on a hike and want to travel light. There's also an optional adaptor available to transform the lens into a wider, 21mm optic. At the other end of the scale, an in-camera 35mm crop mode is available. Since the lens has a maximum aperture of f/2.8, there's plenty of opportunity to control depth of field, and relatively fast shutter speeds can be used when the light level falls. One of the trade offs that Ricoh has made as a result of the larger sensor is that the lens can't focus quite as close as its predecessor. However, there is a macro mode that enables you to get as close as 10cm to the subject. One of the problems with previous Ricoh digital compact cameras was their relatively slow responses. Ricoh is hoping that the new processing engine in the GR will address this, and it has a claimed start-up time of approximately one second, a maximum continuous shooting rate of 4fps, shutter release lag of 0.03 seconds and 0.2 second autofocusing. Unlike several new cameras such as the Panasonic G6, Canon IXUS 255 HS and Nikon Coolpix S9500, the Ricoh GR doesn't feature Wi-Fi communication built-in. But it is compatible with Eye-Fi cards if you want to be able to transfer images wirelessly.